Romanian FX company Becos Effects has added the Pro Stella Compressor to its line of CompIQ pedals. 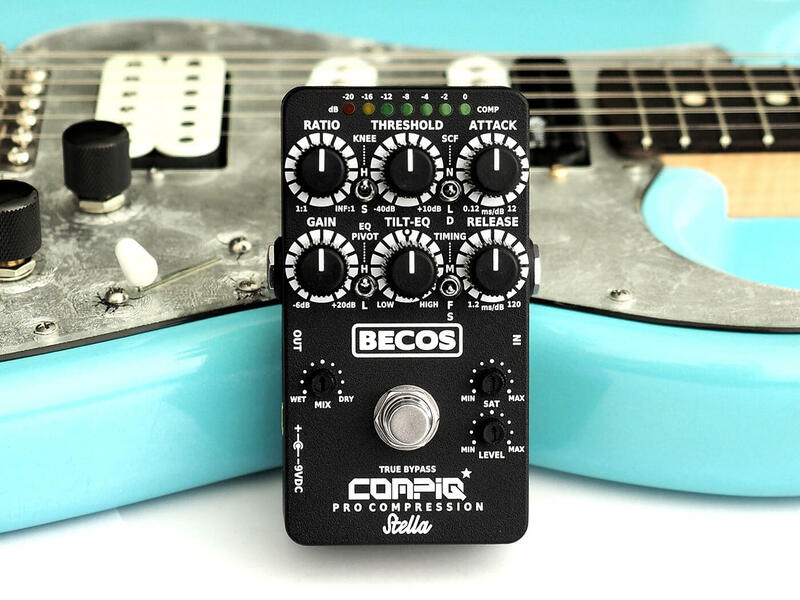 The pedal is designed to provide an array of features – with rack unit-levels of tweakability – in a pedalboard-friendly format. The CompIQ Pro Stella Compressor is built around a THAT Corp Analog Engine, the very same technology featured in rack-style compressors created by DBX, Presonus and the like. The circuit’s compression, limiting and harmonic distortion capabilities are provided by a true RMS-level sensor and a Blackmer voltage controlled amplifier (VCA). The auto-timing circuit is worth mentioning here, because it can be set to respond to playing dynamics – handy when you don’t need to fine-tune timing settings. Another highlight of the CompIQ Pro Stella Compressor is its analog tape saturation circuit. It features independent saturation and level controls, which work in tandem with a wet/dry mix knob to produce a wide range of tones. Lo- and Hi-cut filters add an extra layer of versatility to this circuit. The CompIQ Pro Stella Compressor runs on either a 9V battery or power supply.